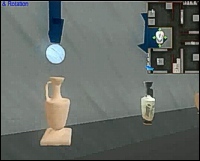 An interactive virtual museum of 3D pottery artefacts has been used as a case study. The virtual visitor can perform queries to the system like ‘Where in this 3D scene I can find vessels similar to this’. Again an attempt to combine a content-based retrieval mechanism within an interactive real time 3D enviroment.